ASBPE’s Boston/New England Chapter held its fourth annual boot camp event on Oct. 14 at the offices of TechTarget in Newton, Mass. The first of three speakers for the half-day program was Peter Howe, the business reporter at New England Cable News (NECN), the largest regional news network in the US. Howe, previously a long-time business reporter and editor at the Boston Globe, focused on providing tips for structuring stories for video and crafting a quality product. For instance, he mentioned the value of ambient sounds to add immediacy and credibility to stories, such as the sounds of air-wrenches in the background in a segment on the auto repair sector. However, Howe stressed that most of the skills required for success in video are the same as for good writing and reporting in print or online. 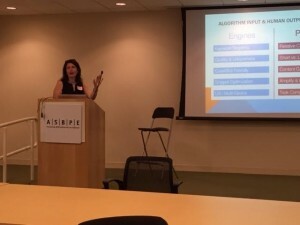 The second speaker, Jessica N. Levenson, addressed development in search engine optimization, or SEO, from changes in Google rankings to the latest “best practices.” Levenson has more than 10 years of experience in search marketing, including four years in B2B. She is currently vice president for search and engagement at TechTarget. The day’s final presenter, immediate national ASBPE past president Mark Schlack, who also is with TechTarget, provided a comprehensive overview of awards programs, including the Azbees. He focused on the value of the programs and the nuts and bolts of applying and winning. Schlack has been honored through the Azbee program and also earned a Jesse Neal Award from ABM. Although most of the dozen attendees were from Eastern Massachusetts, one came from Central Connecticut and commented that the content was so valuable that a repeat trip next year is likely.